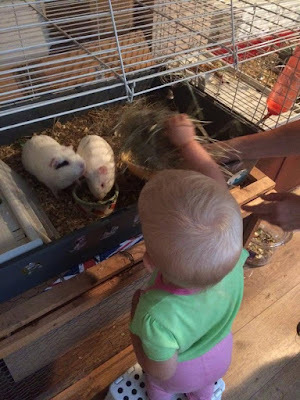 Lily has always loved seeing my mums pet guinea pigs but this time when we visited Lily was even more interested in them. My mum has currently 3 guinea pigs, which isn't actually the most she has had. When I was little she used to have 12 at one point. 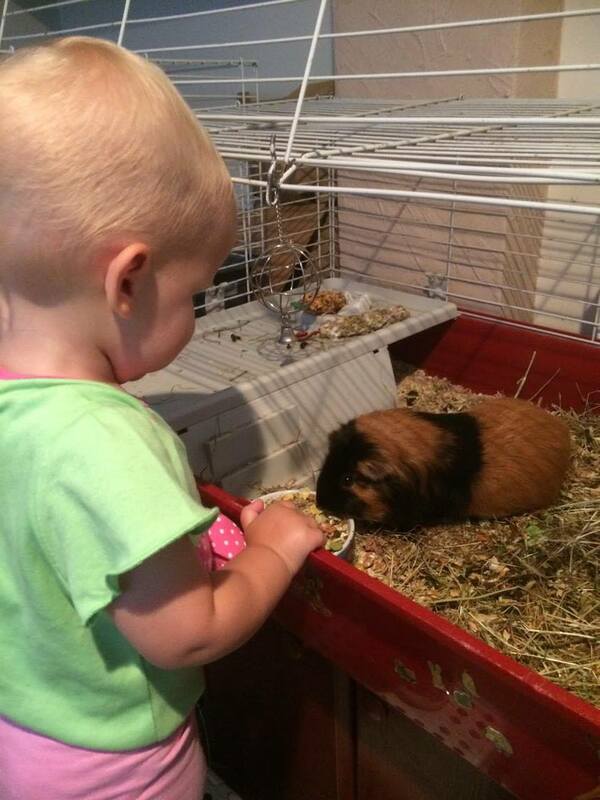 So its always been a family favourite pet. My mum now has Squeaky and he is in a cage on his own. He is really friendly but it became apparent that he needed his own space. 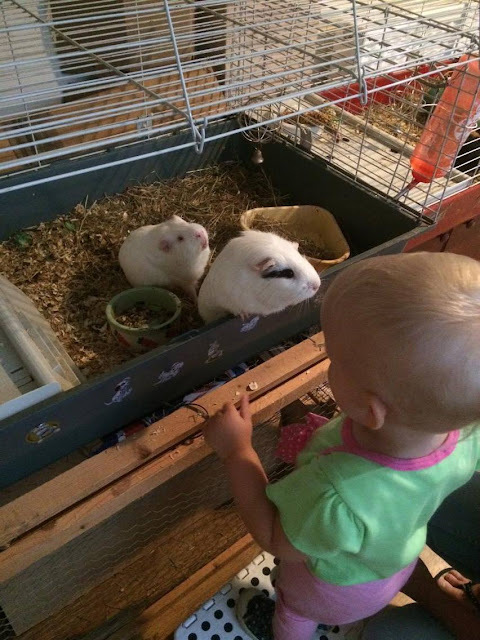 Then my mum has 2 white guinea pigs who are brothers. One is blind and death and so my mum adopted them both together. The blind one also has no teeth. He is so cute and you will often see him leaning his head to the side. 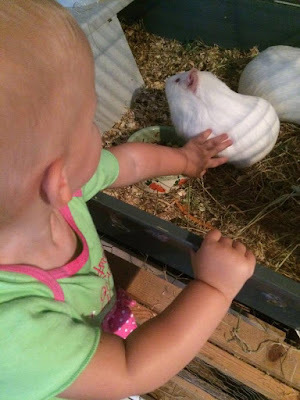 This visit Lily has been really confident with the guinea pigs and has fed them every day and also was really happy to stroke them. Its really nice to see her be so confident with them and also so good with them and being really gentle when stroking them. Lily is only 21 months old so It just shows that as she grows she is also going to grow up to be really good with the guinea pigs. In fact she is already even more confident than I am with them. Guinea pigs can make really good pets as they rarely bite and a lot are so happy to lay on your knee and just be stroked. We won't be getting any guinea pigs any time soon as we have 3 cats. But we definitely would if we had no cats and a garden to have them in. 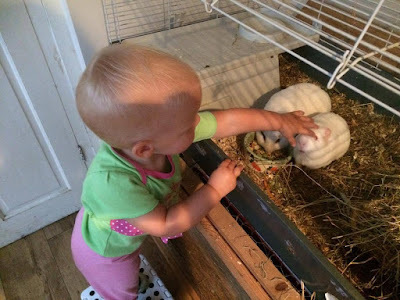 Here are a few more photographs of Lily with the guinea pigs. 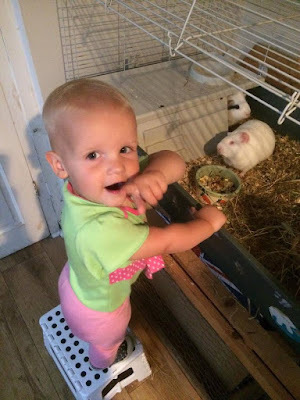 Do your children have a pet they love? We don't have pets yet, but I'm really hoping to get a cat. My daughter is generally really gentle with other people's pets, so I'd love her to have her own. 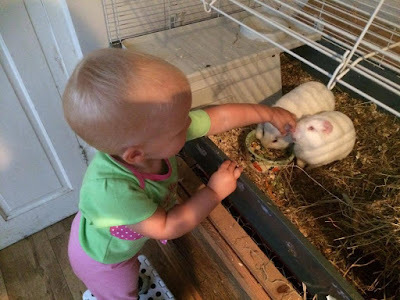 Very cute I love Guinea pigs, we have a rabbit, 2 dogs, a cat and 2 tortoises. We did have a hamster but he had to be put to sleep last week, it was very sad.